Finally, a book for men's spiritual development that actually starts with Jesus. Not lightly baptized Jungian archetypes. Not secular stereotypes that seek to present Jesus as a "man's man." This is good stuff. What exactly does it mean to be a Christian in today's world? Particularly, what does it mean to be a Christian man in 21st-century American culture? Derek Maul, an award-winning columnist and men's group leader, explores these questions in Get Real. The emerging 21st-century Christian man is a spiritual adventurer who's unafraid to find strength in community with others, including other men. This man rejects the phony values of societyùsuch as the incessant desire for power, youth, money, cars, gadgetsùand finds courage in Jesus' invitation: "Follow me." Maul delivers straight talk to men about faith, family, and desire for God in bite-size sections. He draws on his own experiences, including stories from his weekly men's group called The Men's Room. Every man can have a deeper spiritual life. Find out how to follow Jesus and leave a legacy of faith. A Leader's Guide for a 10-week group study is also available. "Derek Maul has written a refreshingly honest book that provides a new angle of vision on the quest for a deeper spiritual life. He has a flair for expressing profound thoughts in clear and provocative ways." "For men even vaguely interested in a deeper spiritual walk, Get Real is the right book at the right time. Derek Maul has a heart for real men dealing with the issues of real life. If you are looking for a great resource that will encourage men and strengthen the family, Get Real is right on the money." 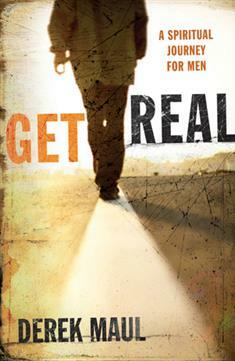 "Derek Maul's Get Real calls Christian men to step unhesitatingly into the reality of new life in Christ. Like the message it echoes, Derek's book is direct and forthright — we are called to and promised transformation through following Jesus. Get Real reminds us that God meets us in the ordinariness of our daily lives and makes all things new through the light of our faith in Christ. And as Derek says, 'Faith is reality.' This book is a welcome traveling companion as we walk — step-by-step, moment by moment — into the reality God has for each of us." "Finally, a book for men's spiritual development that actually starts with Jesus. Not lightly baptized Jungian archetypes. Not secular stereotypes that seek to present Jesus as a 'man's man.' This is good stuff."